The pale grey Ironman 1911 treadmill doesn’t fuss with entertainment features, internet access, or other distracting gadgets. It is a treadmill designed for getting down to the serious business of exercise. The Ironman 1911 treadmill comes with a large 5" x 2.75" blue backlit LCD window with readouts for program profile, time, speed, pace, distance, calories, incline, pulse, and laps. 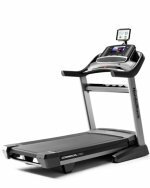 Wt / Dimensions: 205 lbs / 73" x 34" x 59"
UPDATE: Ironman Fitness no longer manufactures treadmills, choosing to focus on their elliptical line. 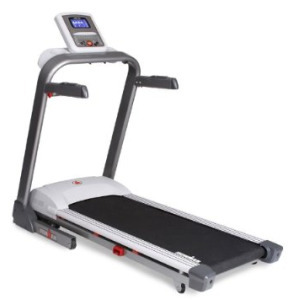 For a similar machine take a look at NordicTrack. The Ironman 1911 treadmill is built on a solid frame made with 14-gauge tubing, and features a cushioned suspended deck of 3/4" composite fiberboard, 60 mm crowned rollers with sealed bearings, and a quiet 2.5 hp continuous duty DC motor. Its 2-stage fold-up design makes it easy to lift and lock the deck out of the way when not in use. For workout features, the Ironman 1911 has remote handlebar-mounted speed and incline controls, an incline range of 0% to 12% in 0.5% increments, and is pre-programmed with 13 workouts. As for the design, its pale grey frame is a different look for 2010 treadmills, a departure from black frames that dominate the market. The future looks brighter for Ironman since its parent company Keys Fitness went bankrupt and Star Trac bought the Ironman brand. Star Trac, a leading commercial equipment manufacturer, began a separate new brand in 2009 called ST Fitness, which share components and designs with the new 2009-10 Ironman models. The Ironman 1911 treadmill is the same model as Star Trac’s ST Fitness 4910 treadmill. All they change is the name imprinted on the belt and frame, and make some slight differences on the console cover. That’s it. What’s amusing is that you will find good treadmill reviews (“Best Buy!”) on the ST Fitness 4910 model and only so-so reviews on the Ironman 1911. Ah, the marketing power of a brand name! And here’s what a name will get you: the ST 4910 sells for $1,495 but is only available through specialty outlets, while the discounted Ironman is available online and in mass market stores. Despite an MSRP of $1,599, the Ironman 1911 sells for $1,179 at Amazon.com which is $100 less than Walmart’s price. Amazon also offers free shipping and a liberal return or exchange policy on all treadmills it stocks. 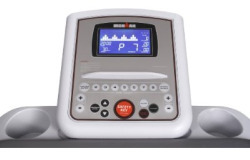 This below $1,200 price mark is very competitive when compared with many quality models, such as the Livestrong LS12.9T treadmill and a couple of Sole machines. The Ironman 1911 treadmill is a good basic machine at $1,200, but if you want a treadmill with a longer belt, a better motor, or goodies on the console, take a look at Sole, Spirit or NordicTrack.